Mark Zuckerberg is set to appear before Congress on Tuesday to address Facebook’s involvement with a political-research company that improperly accessed as many as 87 million user profiles. Based on how stock traders are positioned, they’re expecting Facebook’s recent share-price woes to continue. Facebook‘s stock has taken a serious beating in the weeks leading up to CEO Mark Zuckerberg’s planned appearance in front of Congress on Tuesday. And based on how traders are positioning ahead of the 2:15 p.m. ET testimony, they think the selling can get even worse. Short interest – or a measure of bets that a stock will decline – has spiked to 0.43% of shares outstanding for loan, its highest since September 2015, according to data compiled by IHS Markit. The gauge has more than doubled from its levels in mid-March. The surge in short interest shows just how concerned investors have gotten in just a short amount of time. After all, many investors hold short positions as hedges, with hopes of protecting the money they have already made in a stock. 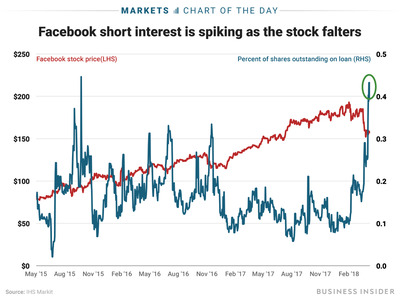 If these traders are able to cash in, that would mean Facebook’s shares added to their already-drastic 16% decline since the start of February. The firm’s issues have snowballed in earnest since reports first indicated that the political-research company Cambridge Analytica improperly accessed 50 million Facebook user profiles. Facebook later said that number was as high as 87 million. Those investors not trading Facebook’s stock will also be watching with great interest to see how Zuckerberg’s testimony affects shares. Back in February, the company’s woes were at least partially responsible for deep losses across the tech sector, highlighting its influence on the broader market. With heavy weightings in multiple major US indexes and exchange-traded funds, Facebook is a market-moving force to be reckoned with. But this time investors know turbulence may be coming and are more prepared for it.